Prime Minister Justin Trudeau hits the campaign trail with candidate Richard T. Lee ahead of the Burnaby South byelection. 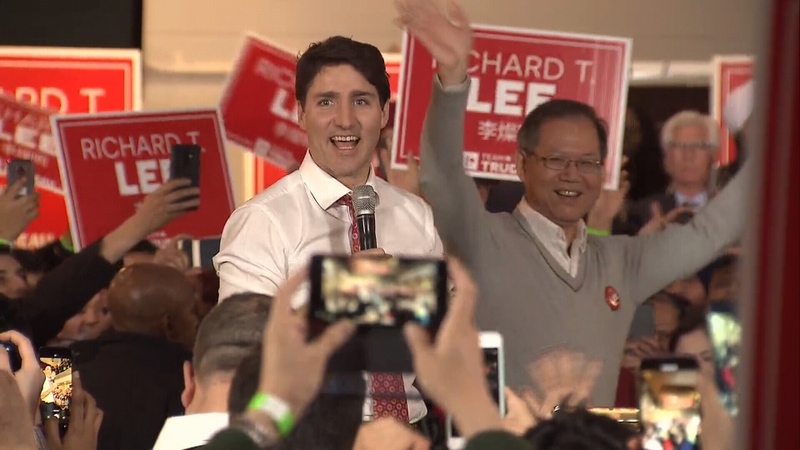 "Make no mistake, the Liberal Party is going to win the riding of Burnaby South with Richard Lee," Trudeau said to a room full of Liberal supporters. The pair spoke for less than 10 minutes at the Shadbolt Centre for the Arts on Sunday. "I believe in a transparent and better politics. I believe in a strong and multicultural Canada," said Lee, who represented Burnaby in the BC Legislature for 16 years. "We need a committed local champion for our community." The Liberal Party fielded Lee as a challenger against NDP Leader Jagmeet Singh in January after former candidate Karen Wang stepped down for publishing offensive posts on WeChat. Outside the Shadbolt Centre, anti-pipeline protesters braved the snowy weather. "We're here because Justin Trudeau is inside and we want to send our message loud and clear that we don't approve of him spending over $4.5 billion on a leaky pipeline and a doomed expansion project," said Thomas Davies with Climate Convergence Vancouver. Protesters could be heard while the Trudeau and Lee took the stage, but the prime minister did not address the protesters. "I think we also hear a reminder tonight that there are going to be people out there who choose the politics of anger, of fear and of division and try to shut people out," Trudeau said. The prime minister did not address the SNC-Lavalin controversy as federal Conservatives are calling on him to waive his attorney-client privilege with former Justice Minister Jody Wilson-Raybould. The Globe and Mail reported Trudeau's office pressured Wilson-Raybould to try and avoid criminal proceedings with the construction giant, adding she was demoted in a cabinet shuffle early last month because she refused to intervene in the case. In a statement Friday morning, Wilson-Raybould, now veterans-affairs minister, said she is bound as the former attorney general by solicitor-client privilege and cannot publicly talk about aspects of the case. Trudeau did not take questions from the media at the rally. Prime Minister Justin Trudeau hits the campaign trail with candidate Richard T. Lee.